Seriously. Is it the food equivalent to writer's block? I really couldn't think of anywhere to eat after hockey on Friday. Of course, much of that had to do with trying to satisfy locational and type of food concerns for the team. But really, there must be places open late for eats right? Well, Gordo came to the rescue when he suggested Public Lounge Eatery on Main which also happens to be his brother-in-law's joint. Open until 1:00am, it fit within our schedule since we wouldn't be out of the ice rink until 11:00pm. 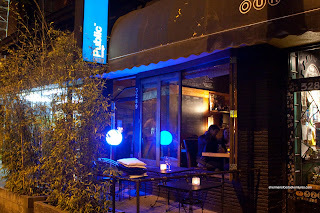 There was one sticking point though - it's a tapas place. So what's the problem you may ask. Well, tapas usually an excuse for small portions and high prices. 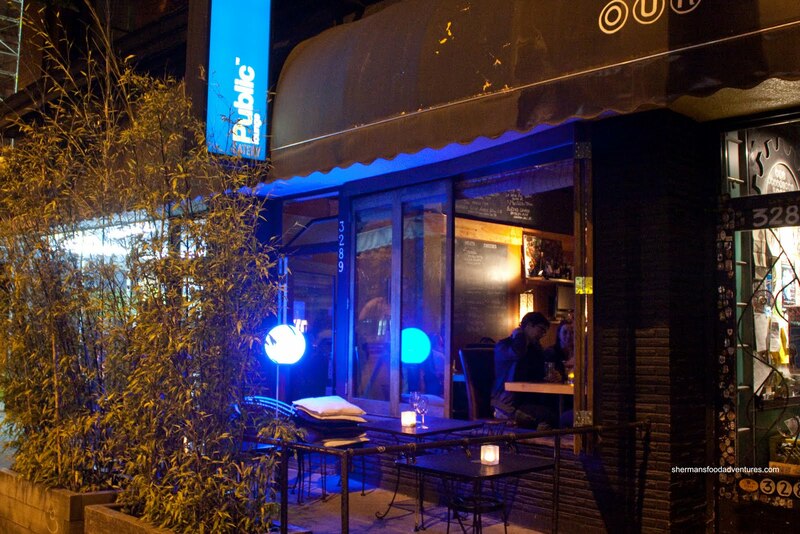 Well, the good news about the menu at PLE is that only a few items are $10.00 and over. We ended up splitting up into 2 tables because the place was pretty full and not really all that big either. 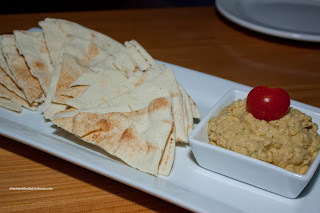 So Milhouse, Apu, Boss Woman and myself ended up sharing a some dishes starting with the Dill Hummus with pita. Right away, we noticed that the portion size was in line with the price of $6.00. This was a good start literally and figuratively. The hummus had a nice texture that was smo oth yet not over-processed. We really didn't notice the dill too much; yet we did get good hits of lemon and garlic. The one thing that could've put this over the top would be toasting the pita. It was a little cold and hard. 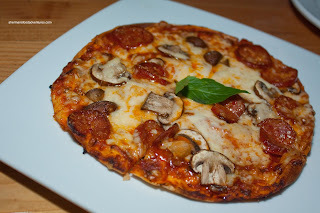 Next up was the Chorizo Pizza with cremini mushrooms on a pita crust. To put some scale into the size of the pizza, imagine it smaller than a small (roughly 6"). So at $10.00, it certainly was not exactly cheap. On the other hand, the flavour made up for the lack of size. The tomato sauce combined with dry-cured chorizo made the pizza very zest y. There was the right amount of toppings and cheese, so every bite had texture and taste. The crust itself was fairly crispy and thin. Loved the fresh basil on top - only wished there was more of it. Now for the same amount of money, we thought the Roast Back Ribs a much better value. With 6 really large and meaty ribs, this could've been a main entree if there were a side or two. These ribs were moist and fall-off-the-bone tender. The maple BBQ sauce was sweet with a bit of tang. We felt that the ribs themselves could've used a bit of salt. Other than that, this was a real crowd-pleaser. 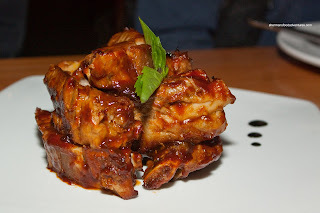 These were never a dvertised as BBQ ribs and in a way, most of us preferred it this way. Of course authentic BBQ would mean smoking or cooking them for a long period of time from a raw state, which would render them dry. Good for BBQ purists; but we like it this way instead. Then we had something most Chinese people would cringe at - Anthony's Wontons. True, ordering wontons in a non-Chinese restaurant can usually mean 2 things: overpriced and not good. Well, at $8.50, this was not exactly cheap. Remember, we cannot poss ibly compare a wonton noodle joint with a place such as PLE. Just like you cannot compare it with Bao Bei or Terracotta. Not the same. So yes, it would be expensive if we say compared it to spicy wontons at Chinese restaurant. There was roughly a $3.00 premium paid here. Yet, the place is trendy, washrooms are clean and there is infinitely more booze choices other than Tsing Tao. Ultimately, the wontons were good. We were all Chinese and we all liked them. It was a balanced combination of pork and prawn with some water chestnuts. 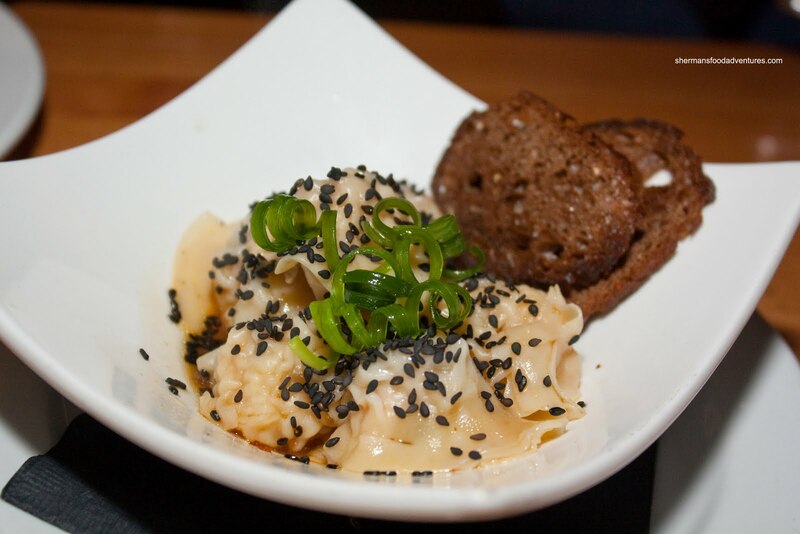 The wontons themselves were slightly bland; however, the sesame oil soy vinaigret te added the necessary flavour. 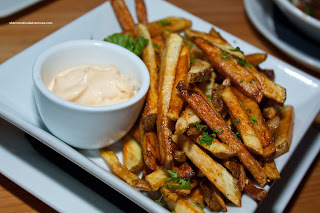 Lastly, we had the Frites with pepper & truffle oil and aioli served on the side. These were fresh cut and fried until crispy. Well, most of them were, some of the larger fries were not as crisp. I didn't get much truffle oil; but the aioli was quite good. Since the place is quite small, we had to split up into 2 tables with Gordo, Emilicious and Sweet Tooth sharing their own dishes. Gordo ordered the Carnaroli Risotto with wild mushrooms, parmigiana and pinot gris. 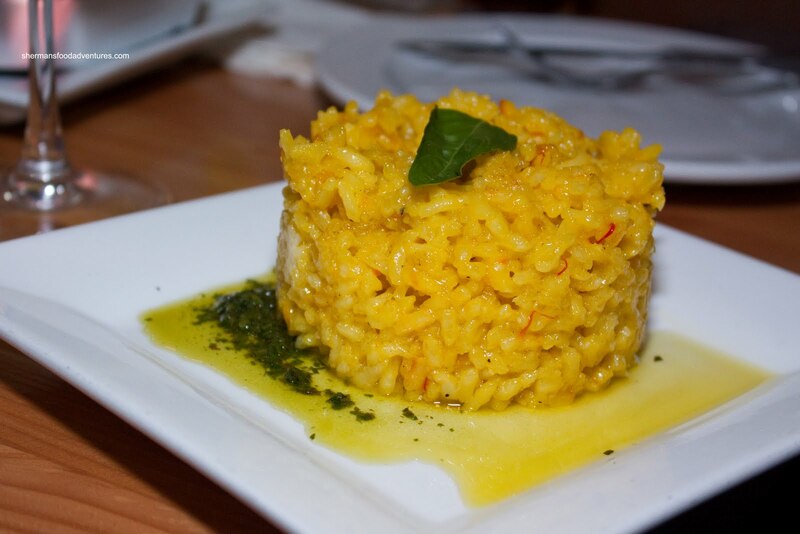 For me, I found the risotto to be overcooked. I'm not sure if this was the intention or not since they formed it into a cylinder. Furthermore, it was very salty albeit very cheesy as well - this goes hand-in-hand though. 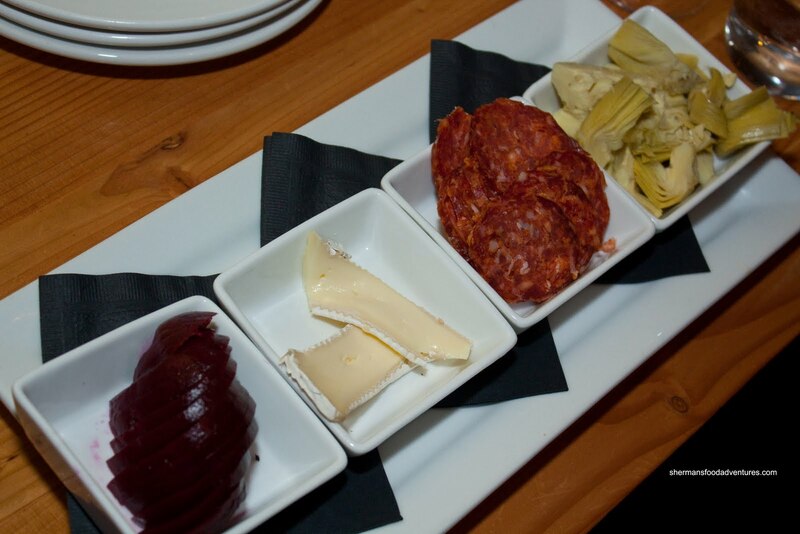 Lastly, they got Antipasto for 2 consisting of beets, brie, spicy salami and artichoke hearts served with crackers. I didn't get to try any; but they said it was pretty standard stuff. In general, most of the food we tried was pretty decent except for the risotto. Combined with reasonable prices (as reasonable as tapas can be) and a lively environment, Public Lounge Eatery is a good place to meet up with friends for some spirits and some food to snack on.